A richly illustrated social and cultural history of post-revolutionary Mexican architecture. The period following the Mexican Revolution was characterized by unprecedented artistic experimentation. Seeking to express the revolution's heterogeneous social and political aims, which were in a continuous state of redefinition, architects, artists, writers, and intellectuals created distinctive, sometimes idiosyncratic theories and works. Luis E. Carranza examines the interdependence of modern architecture in Mexico and the pressing sociopolitical and ideological issues of this period, as well as the interchanges between post-revolutionary architects and the literary, philosophical, and artistic avant-gardes. Organizing his book around chronological case studies that show how architectural theory and production reflected various understandings of the revolution's significance, Carranza focuses on architecture and its relationship to the philosophical and pedagogic requirements of the muralist movement, the development of the avant-garde in Mexico and its notions of the Mexican city, the use of pre-Hispanic architectural forms to address indigenous peoples, the development of a socially oriented architectural functionalism, and the monumentalization of the revolution itself. In addition, the book also covers important architects and artists who have been marginally discussed within architectural and art historiography. 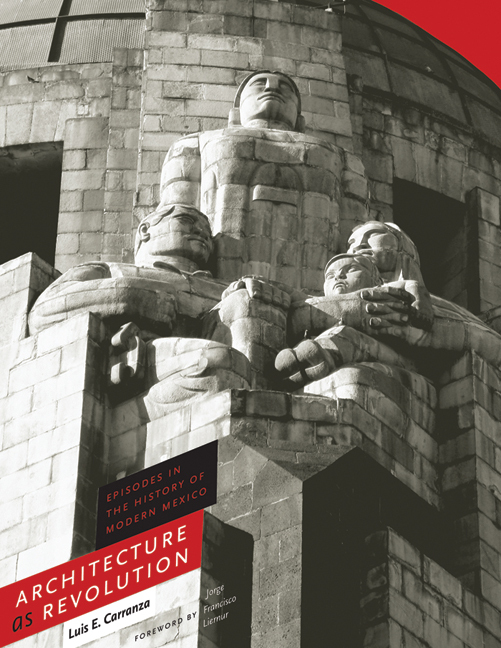 Richly illustrated, Architecture as Revolution is one of the first books in English to present a social and cultural history of early twentieth-century Mexican architecture. Luis E. Carranza is Associate Professor of Architecture at Roger Williams University in Bristol, Rhode Island. The Revolution began as a discovery of ourselves and a return to our origins; later it became a search and an abortive attempt at a synthesis; finally, since it was unable to assimilate our tradition and to offer us a new and workable plan, it became a compromise. The Revolution has not been capable of organizing its explosive values into a world view, and the Mexican intelligentsia has not been able to resolve the conflict between the insufficiencies of our tradition and our need and desire for universality. These conditions are central to understanding the architecture and architectural discourse produced in Mexico after the Revolution, most easily defined as a popular insurrection that removed from power the thirty-five-year dictatorship and regime of Porfirio Díaz. The period following the Mexican Revolution is characterized by Mexican intellectuals and politicians alike exploring the social potential of art, architecture, literature, and other cultural productions in the transformation of Mexican society. It is also a moment when the Mexican state was forced to evolve due to the Revolution's largely undefined social dimension and its continuous redefinition. Although resting on the Mexican intelligentsia's ability and freedom to begin a process of reconstruction, this period relied on new cultural paradigms and shifts to (re)construct an ideology and a cultural practice that refocused the importance of the artist or cultural producer in a sociopolitical realm. The politicization of art, in response to and as assembled from European, Latin American, and Mexican aesthetic examples, specifically provided numerous outlets for experimentation in art, literature, and architecture. The Revolution, then, was the catalyst that fomented in Mexico—between 1920 and 1940—an unprecedented experimental artistic production. This so-called Laboratory of the Revolution heightened the effects and complexities of the upheaval by inciting, formulating, and structuring a wide range of aesthetic and ideological responses. The Revolution and its subsequent cultural manifestations strongly affected the production, dissemination, and reception of architecture along with the ideological role of architecture, its producers, and its promoters. Its ambiguous direction and aim specifically affected architectural culture: different architectural solutions reflected varied understandings of the Revolution's significance. Within architecture and its allied arts, for example, at least three ideological camps can clearly be demarcated as addressing the perceived aims of the Revolution itself: a socialist or Marxist strain; a nationalistic or Mexican one (sometimes pre-Colombian in character); and one that followed the lead of the European and North American avant-garde. These differences, in turn, manifest the issues, means, and solutions needed in the search for an appropriate architecture for the Mexican people. The multiple architectural variants produced should be seen, therefore, as legitimate articulations to grasp and address the direction that the nation was undertaking after this most momentous event. Some of them should be understood as paradigms questioning or subverting the existing modes of production through their entry into the realm of architectural or linguistic autonomy—as work separated from life. Others should be seen as working within the modes of production while using available means to question their hegemony or to improve the living and working conditions of the lower classes—using the very structures in place, in other words, to transform life. Clearly, Mexican architectural production responded to constraints similar to those faced by the European avant-garde. Yet, to a degree equaled only by the Soviet avant-garde, Mexican spatial and architectural manufacture addressed specifically the seemingly utopian call of a realized Revolution. However, it is necessary to accept the concept—put forth in Latin American cultural and theoretical circles—of Mexico's incomplete modernization. This has been most poignantly defined in Néstor García Canclini's Hybrid Cultures (1989). At the core is the notion of "exuberant [cultural] modernism with a deficient [sociopolitical and economic] modernization." The realities of that modernization (insufficient or not) ultimately affect the sense and materialization of the urban realm and its architectural developments. As a result, much of the focus of the Mexican avant-garde and its architectural explorations is centered in the site where and through which the traditional avant-garde operates: the modern metropolis. That group's central characteristic is a condition of continuous transformation working in the service of humanity. As a result of the interdependence of architectural production and its sociopolitical context, the new architecture in Mexico developed out of existing and newly formed links between architects and the literary, philosophical, and artistic avant-garde. Intent on transforming society, the project of architecture was taken up by a large non-architectural component of cultural producers searching for the means to influence the masses. After all, architecture reflected the needs, desires, and struggles of society; it was understood as the material expression of that society, as it shows who benefits from it and how; and, finally, it was seen as the most direct means to reach a large audience who experience it daily through apperception. Some prerevolutionary art, such as the work of José Guadalupe Posada, which utilized means of mass reproduction to reach broader audiences, served as a constant precedent. Through inexpensive and readily available printed broadsheets, Posada graphically and textually describes the unrest beginning to develop due to the marked differences in the quality of life between the rich, or those favored by the government, and the poor. Posada's use of calaveras, or skeletons, in many of his engravings, as in Revumbio de calaveras (A Noisy Gathering of Skeletons, undated), provided an eschatological view of class and national divisions united by a common fate: death. The death theme represents, according to González Ramírez, "the idea of equality: in the face of death all values, all differences, all protestations lose the deceit that social conventions lend to them." Posada's work portrayed a bitter critique of dishonesty, unfair election processes, and what was known as "dollar corruption," or the corrosive effects of foreign investors. In Posada's popular broadsheet titled El mosquito americano (The American Mosquito, 1903), the text describes the annoying "mosquito" that as a tourist is a pest and as a political, industrial, and technical advisor brings dollar corruption with him. Other critical forms of artistic production in both the pre- and postrevolutionary periods were centered around a process now known as "transculturation." For literary critic Ángel Rama, who advanced the idea of transculturation, Latin America "has had to select the rejected elements of the European and American systems produced in the metropolis, peeling them away from their context and making them their own in a risky, abstract way." Transculturation is a critical and selective process through which Latin American cultural producers take certain elements (or structures) from an admired or colonizing culture and substitute them for their own. Many times, the process combines these foreign elements with selective aspects (or structures) of the producer's own given culture in new and inventive ways—not always as expected or as proposed by the originating cultures. In most cases, transculturation was enacted as a response to the seemingly unmediated (and at times, imposed) application of European traditions during colonization and later, especially in the second half of the nineteenth century. In Mexico this application was manifested by the governing Porfiriato elite in its obsession with Paris—the proverbial capital of the nineteenth century—and its architecture, urbanism, and forms, as well as through the use of philosophical positivism and literary naturalism. The Díaz government, for example, tried to promote a refined and civilized Mexico, equal to any of the great European countries, through its architecture and urban planning. As such, many of the public buildings of the time primarily reflected French styles. The domestic architecture for the elite predominantly reflected nineteenth-century European architecture, with many choosing French mansard roofs and neoclassical houses. Through it, the Mexican bourgeoisie intended to link itself with the aristocracy and history associated with the old world. Paradoxically, while many of these relied on French architectural and planning techniques such as axial organization and placement as well as on neoclassical or French baroque ornamentation and detailing, their internal organization maintained the typical colonial courtyard typologies. Large avenues and parks were similarly created to echo their French counterparts. Paseo de la Reforma, modified in 1899 by the architects Juan and Ramón Agea, cut through the orthogonal grid of Mexico City and provided axial foci and tree-lined sidewalks similar to those of the Champs Elysées. Within literature, Mexican writers adopted the genres of French realism and naturalism that stemmed not only from their French counterparts but also from the positivist environment that Díaz' científicos, or intellectual advisors, created. The realist novel permitted the writer to narrate a reality while being outside the work itself as an omniscient presence. Within these novels, however, one can note sharp class distinctions, with the wealthy or those favored by the regime disparaging the lower, less privileged classes. These writers showed a contempt for society as it was but did little to change it through their writings. Around the turn of the twentieth century, a new literary aesthetic began to emerge throughout Spanish-speaking Latin America: modernismo. Its primary intentions were to replace current and past literary production and to thoroughly understand the latest European literary trends. Modernismo in the Mexican context was highly progressive and nationalistic, motivating writers to undertake periods of aesthetic searching and discipline. Within modernismo was a preoccupation with form, as characterized by the literary journal Revista Azul (1894-1896), and a concern with symbolism, exemplified by Revista Moderna (1898-1911). Rejecting the Porfirista reality of the day, the modernista artists working at the turn of the century sought imaginary worlds based on a repertoire of Greek or Roman symbolism with the intention of stimulating a culture of beauty and poetry reminiscent of a golden age. In this modernista work we find the traditional fin de siècle motifs assimilated into the Mexican arts. Reactions and feelings associated with the rapid industrialization and metropolization of urban centers are registered in modernista paintings of the early twentieth century as well. Some artists depicted the problems and human misery associated with these newly industrialized environments, and a return to rural simplicity, whether real or imaginary, can be seen as a reaction to them. The work of artists like Saturnino Herrán evokes a nostalgia for the land, the campesino (peasant), and rural traditions. During the last years of the Porfiriato, many artists changed their focus and began depicting the worker—a subject that increases with the Revolution and culminates with the Escuela Mexicana de Pintura (Mexican School of Painting). Again, in reaction to the Europeanizing tendencies of the government, artists turned their gaze toward Mexican popular arts, as these represented for them the most genuine expressions of a national culture and stood as possible models for the arts. As a symbol of the national spirit, the mestizo culture, based on the mixture of races—predominantly the indigenous and the Spanish—and the traditional folk arts served aesthetic and political purposes and corresponded to a new concept of national culture and identity. The artistic intelligentsia sought to fuse this new concept with other artistic, political, and philosophical ideologies. As social and political unrest increased during the last years of the Díaz regime, literary production also experienced uncertainty. A shift toward morality occurred, either through Christianity or regional customs, in many of the works produced. Characteristic of the latter, Mariano Azuela's early works, such as Los fracasados (1908) and Mala yerba (1909), depict rural life under Díaz. Throughout the Revolution, no profound literary changes took place. Nonetheless, its paradigmatic text is, without a doubt, Azuela's Los de abajo (The Underdogs, 1915). Through it Azuela examines the qualities of the Revolution as a social event and a force so strong that it drags all the individuals around it into its motion—defining the characters' actions. The novel, as its subtitle suggests, presents a series of "Pictures of the Revolution" that demonstrate its force and human qualities as they affect the previously static character of Mexican society. In the realm of poetry, most writers remained tied to the prerevolutionary generation of modernista poets exemplified by the tradition of Enrique González Martínez and Ramón López Velarde. Nevertheless, this period was a crucial training ground for those who would later become the leaders of the postrevolutionary literary intelligentsia, including the Estridentistas and the Contemporáneos. In many cases the young writers published their work at the time in small periodicals like Gladios (1916), San-Ev-Ank (1918), and Revista Nueva (1919) whose public life usually lasted only a few issues. Despite the proportionately small amount of work manufactured and published during the Revolution, a great deal of intellectual work had begun that would become the driving force of cultural renovation. This took place, for example, within the Ateneo de la Juventud (Atheneum of Youth), whose members aimed to exorcise the Díaz regime's philosophy and aesthetics. Also part of that cultural stage are Los Siete Sabios (The Seven Sages), also known as the Generation of 1915, whose social, political, and philosophical work and ideas would influence a postrevolutionary generation of thinkers. Because of the political and social instability, it is understandable that architectural production dropped dramatically during the Revolution. Since most of the practicing architects of the time were graduates of the Academia de San Carlos in Mexico City—the Mexican equivalent of the French École des Beaux Arts—the limited architecture produced during this time continued the stylistic preferences from the Díaz regime. The architectural scene would remain the same for a short time after the Revolution primarily because of the academic backgrounds of practicing architects of the time and the conservative nature of the clients who funded their work. Most of the changes in architectural production were promoted by the new generation of architects exposed to modern international architectural developments but also to the multiplicity of theories and ideas associated with the Revolution. With the fall of the Díaz regime, the artistic intelligentsia turned its gaze toward the social qualities of art and literature in an attempt to vindicate Mexico's national character after the Revolution. While a variety of tendencies came to the surface, the primary goal was to find an aesthetic that represented the believed or understood cultural aims of the Revolution in a style appropriate for the Mexican people. In disputing, as morally and formally bankrupt, the older European traditions that were central to the Díaz regime and its representation, the postrevolutionary Mexican avant-garde assigned itself the task of addressing issues of identity formation, class and race consciousness, and the role of art in the praxis of life. Paradigmatic yet paradoxical was the turn toward modern international architecture. This signified both a shift away from the architectural eclecticism of the Porfiriato and its ideological underpinnings and a search for an architecture rooted in classless scientific, universalist, and collective ideals. Modern forms, after all, represented a rejection of traditional—considered bourgeois—architecture in favor of a modern, public architecture and space designed through the logic of utility and comprised of programs, materials, and products of its era; these were schools and housing, cement and steel, and radio antennas and smokestacks, respectively. The young architect Juan O'Gorman, for example, read Le Corbusier's Vers une architecture (1924) as a manifesto for a new type of architecture based foremost on functional requirements. As a result the house he designed for the painter Diego Rivera reflected this as well as Le Corbusier's own formal explorations (seen, in particular, in the 1922 studio for the painter Amédée Ozenfant). Similarly, in seeking an architecture that eschewed monumentality, O'Gorman, like German functionalists of the time, revealed the structure, services, and constructive materials of the house—leaving the water tanks and electrical wires exposed and the roof unplastered to reveal traces of its construction and arranging cactus plants as a protective fence. In addition, the Mexican avant-garde enacted a semantic rearticulation, or transculturation, of the ideas, forms, and traditions of the historical European avant-garde. This was based not only on the changing historical and geographic contexts but also on the urgency of addressing different audiences and intentions after the Revolution. This is characteristic of the Estridentistas (literally, the Stridentists), who beginning in 1921 created a new "architecture" and "falsified cities" within the space of their poems and graphic work to reflect the vertiginous mentality of modernity itself and of Mexico within that context. Clearly, the Mexican avant-garde owed a great deal to the international avant-garde. The Estridentistas in particular relied on the ideas and theories of Futurism, cubism, Vicente Huidobro's creacionismo (Creationism), and other movements—all ideas that circulated in Mexico at the time. After all, Mexico, like many other Latin American countries, imported large amounts of culture through the mass media and through the exportation and repatriation of many of its intellectuals who trained abroad. This was the case of the painter Diego Rivera, whose formative years as an artist took place in Europe sponsored by the Mexican government. Finally, working primarily in environments whose modernization, as noted earlier, could be described as "incomplete," these artists and architects were compelled to call into question the role of new technologies—central to a large part of the European avant-garde—as well as their impact on form. This gave a particular potency in Mexico to the debates between abstraction and representation. This is most clearly seen where architects used a vast amount of aesthetic and constructional knowledge from the past. Here the reliance on traditional models was intended to create a seamless syncretism with new forms and means of production. This architecture was primarily intended for Mexico's largely indigenous and illiterate audience, whose understanding relied on their lived experience with original historical objects and their collective historical memory. For architects like Manuel Amábilis, the revolutionary potential of this architecture lay precisely in the fact that it addressed people whom the Porfiriato largely ignored and in its ability to stir their historical and cultural consciousness. The problems of communication and legibility, of how architecture and its messages became read and understood by the population, were addressed through the creation of intelligible and monumental art and architecture. It should be noted that the Díaz regime used this type of monumentality to symbolically represent its power to the people. Essentially, the authority of these monumental structures came from their overwhelming scale, their forms, or their allusions to historically specific and recognizable forms. But architects responding to the social needs of the masses after the Revolution also relied on historical or monumental forms precisely because of their symbolic legibility. While avant-gardist experiments were intended to radicalize into a new, revolutionary tool the vicissitudes of modernity, monumental architectural forms stood in contrast to the protean condition of modernity. Instead of further alienating the Mexican population, monumental and historically based forms pointed toward a new order and collective sensibility of permanence, historical commemoration, and communicability. It is this logic of visibility and legibility that shaped the mural movement and the creation of iconic structures—such as the Monument to the Revolution (1938)—that were to express the intentions of the postrevolutionary government. The paradox of the turn to monumentality, however, lay in its dialectical condition: either it served to educate and empower the masses through communicative mechanisms that could be experienced collectively (such as architecture, mural paintings, and printed broadsheets), or through similar mechanisms this project could be used as an tool for the ideological reproduction of power. The first politicizes art, and the second, as Walter Benjamin would note of repressive regimes, aestheticizes politics. was meant to be an agrarian reform, returning the lands to those who had lost them and returning those lands that were considered public federal land to those who did not have any, . . . to guarantee the rights of workers but without endangering the existence of capital that was not only necessary but indispensable to the nation. Agrarian reform, then, only returned land to the farmers who had previously owned them without abolishing the structure of private property. Since the impetus of the Revolution was centered on attacking the "privileged few" whose business and economic interests had been "aristocratically" protected and promoted by the Díaz regime, the Revolution—reconstituted by the state—was transformed into the impetus for democracy, free enterprise, and free trade. This reconstitution ideologically reproduced a class structure similar to that of the Díaz regime but without the limitations of privilege, enacting a true laissez-faire economy. In the end, in the words of Vicente Lombardo Toledano, the Revolution created a new form of dictatorship, "neo-Porfirismo," centered within the political party that embodied the institutionalized Revolution: the Partido Revolucionario Institucional (PRI, the Institutional Revolutionary Party). The very necessity of capital for the advancement of the nation, according to Córdova, served as the structure upon which the dominant classes developed a strong federal government. Its aim was to ensure the material development of the nation through any means necessary. The creation of a strong state served to maintain the existing economic structures by justifying them ideologically. This new state could act to organize the masses and serve as their advocate under the guise of improving the social conditions of the country. Proposals such as José Vasconcelos' educational, artistic, and cultural public school system were seen as tools to appease the masses; the state justified foreign investment with the argument that modernization was urgently needed to improve the social situation of all Mexicans. These goals superseded the socialist aims associated with the Revolution. [T]he task of economic policy is to dictate a continual revolution of incomes and the propensity to consume, which will maintain global production and investment and will thus bring about the only form of political equilibrium that is possible . . . This, then, is how we can sum up the spirit of the theory of effective demand: it assumes class struggle, and sets out to resolve it, on a day-to-day basis, in ways that are favorable to capitalist development. The development of the state, therefore, had as its starting point the moment of crisis: it would, as historian Manfredo Tafuri argues, "actually make this 'negativity' (the negative of the working class) function as a 'necessity' intrinsic to the processes of the system." This transformation, in tune with working-class demands, led to the transformation of ideology into a utopian idea. Through this, the development of utopia—more specifically, the work needed for utopia—went hand in hand with the structures required for the development of the state. On the one hand, there is the alternative that, directing its concept of the autonomy of art or more in general of culture itself, it easily arrives at the solution of evasion, of disengagement, or, as it is usually told, of the formal and individualizing exaltation of the creative moment. On the other hand, the opposite alternative is one that, directing all of the social commitment of the man of letters, the writer, the poet, the urbanist, and the architect, easily arrives at an integration within the fundamental reason, politically and economically, of development. For Asor Rosa, these positions were two sides of the same coin: as work dependent on the political and economic conditions of the system or, by rejecting work itself, as the system's indispensable guardians. These alternatives, nevertheless, signified intellectual labor's entry into the cycles of production. As a consequence of this compromise, the utopian proposals that the intellectuals or artists supported would always-already be favorable to the development of the state and of capital in general. Despite the absolute closure established by this effectively Tafurian critique of ideological resignation to the modes of production, the role of avant-garde practice should not be seen as ripe for totalizing or essentializing analysis. After all, Peter Bürger's basic premise in his Theory of the Avant-Garde (1974) was that the avant-garde negated the autonomy of art through its integration with the praxis of life, placing art in a precarious situation within the cycles of production. For Bürger, the transformation of the function of avant-gardist art, the transformation of its production, and the questioning of its reception proposed a semi-autonomy of art that oscillated between the two poles outlined by Asor Rosa. Through this, the work of art denaturalized and questioned, if only briefly, those systems of production until, once absorbed by them, its ineffectuality became a critical point of reference. This semi-autonomous nature, nevertheless, was highly unlikely given that the actual conditions for the production of this work would already be tangled in the "ideological bunches" permeating aesthetic production; among these were the ideologies of patronage, class, work and production, and so forth. Without realizing this closure and their complicity, though, many members of the historical avant-garde attempted to overcome the limitations imposed by class structures and the available means of production. Guided by a utopian worldview, these artists attempted to transform the effects of capitalist production—alienation, commodification, reification, and the like—through artistic production. The fragmentation of the subject caused by the division of labor was, for example, one of the issues avant-garde artists countered in order to return a sense of totality to the individual. By reproducing the chaos of the modern metropolis, these artists intended to acculturate their audiences to that identical condition to attain control of it during the class struggle. Again, these positions tacitly fell into the realm of collaborative ideology, defined as false consciousness, and helped reproduce the existing conditions of production; for Tafuri, "To ward off anguish by understanding and absorbing its causes would seem to be one of the principal ethical exigencies of bourgeois art." Despite this, the avant-garde operated through tactics that served briefly at their inception—and until shortly after the realization of their ineffectuality—to put in question the system's overarching structure. From all of these positions, a series of questions develops regarding the role of art and architectural production within the margins of capitalist development in general and in postrevolutionary Mexico in particular. What was the role of the Mexican artistic and architectural intelligentsia vis-à-vis the development of capitalism? Or, more specifically, how was the rule of capitalism developed through artistic and architectural work? What was, in the end, the effect of the Revolution—understood in its broadest sociopolitical and economic sense—on the labors of the artistic and architectural intelligentsia? The links developed between the literary, philosophical, artistic, and architectural avant-gardes point to their complex resolution of the sociopolitical and economic developments after the Mexican Revolution. The manner in which these links materialized within architectural products shows the tactics on which architects relied. However, these links not only point to the ineffectuality of architecture against the ideological manipulation of capital but also to their position within the structure of the postrevolutionary state. Citing Córdova, it could be argued that this state used cultural production in bolstering and strengthening its own organization and development in Mexico. As a result of the paradoxical nature of this cultural production and the mercurial meanings of the Revolution, any analysis of Mexican modern architecture built or conceptualized in the years immediately after the Revolution must address these conditions. Because of their changing nature, however, a study of this history must preclude a teleological history. Instead of monumentalizing, homogenizing, and reifying history, this analysis must rely on a genealogical model to achieve two ends: first, to acknowledge the complexity of the histories that simultaneously developed around the manufacturing of architecture and that oppose, metahistorically, a search for origins; and second, in a broader sense and as result of the preceding point, to introduce the same discontinuity and instability into the historical discourse present within history itself. Structured in the form of paradigms—which Walter Benjamin and Theodor Adorno generally referred to as "constellations," or self-contained clusters of ideas—the historical episodes herein presented are intended to "collide" with each other to present a fuller and more dialectical vision of the history of Mexican modernism. As such, this study is not meant to address all of the aesthetic, social, and political positions fomented by the Revolution, something that would be ideologically suspect. Instead, it focuses on specific architectural explorations engendered by the varying positions on and differing opinions about the Revolution. The choice of these explorations was limited by their avant-gardist intention—as understood by Bürger—to engage art in the praxis of life and put into question the ideological reproduction of capitalist society. The choices also are framed by the nature of the struggles engaged by architectural producers against the status quo and in favor of a reconceptualization of the structure of society. By studying the artistic, literary, and architectural tendencies that emerged after the Revolution, architectural production becomes part of an intertextual response—instead of a divided and reified practice—to its perceived cultural impulse and to the debates and polemics emerging within the European, American, and Latin American avant-garde. At the same time, the choice of paradigms acknowledges the ideological power of capital to co-opt these investigations into the emerging structure of the state as the planning agency defined by Negri and Córdova. The organization of the present study, therefore, follows a set of episodes. These, in turn, abide by a loosely arranged chronological sequence to cohere within the historical development and transformation of Mexico. Although structured in this manner, these episodes do overlap and are intended to be read dialectically against each other and against traditional historiography. The episodes are the following. In Chapter 1 I address the headquarters building for the Secretaría de Educación Pública as a representative architectural example for modern Mexico. By exploring José Vasconcelos' philosophies and influences, the building is seen as a materialization of his vision of the Mexican Revolution and belief in the power of historical and cultural miscegenation as articulated in his book La Raza Cósmica. The building, in its architectural, painterly, and sculptural programs, was an attempt to improve the material conditions of the country through educational and artistic practices to engender a transcendental experience and lead to, in turn, a social utopia for Latin America. In the second chapter I define the relation between the literary avant-garde and the understanding, production, and dissemination of art and architecture. Through a study of the work of the Estridentistas, this chapter elaborates the transformation of ideas imported from the European avant-gardes into the context of modern Mexico. The Estridentistas proposed new and alternate readings of the modern city as the locus of socialist insurrections to align with the Revolution and further social uprisings. Here, acerbic avant-gardist mechanisms were employed to transform life and show that art and architecture held potential for the social development of the country. The Mexican Pavilion in the 1929 Ibero-American Exposition in Seville, its architect, and his theories are the subjects of Chapter 3. At the core is the architect Manuel Amábilis' construction of a mythical history of pre-Hispanic Mayan architecture. By relying on the legend of Atlantis, this history was to reconceptualize pre-Hispanic Mayan forms as having a utopian, modern, social value. As a historian, Amábilis articulated his vision of architecture as rooted primarily in the great past and socialist architectures of Mexico. In the post-Revolution context, these forms were not only easily understood by the majority of the Mexican population—indigenous by origin—but their revival served as a rejection of the architecture of colonization and exploitation. The pavilion at the Seville fair represented Amábilis' ideals as well as a confrontation with Spanish economic neocolonialist and imperialist practices associated with international exhibitions. In Chapter 4 I explore how Le Corbusier's functionalist propositions were retheorized and radicalized by Juan O'Gorman. By rejecting any aesthetic merits of architecture, he proposed to solve in the most economical and direct way the pressing needs for hygienic housing and schools that the Revolution had made apparent. O'Gorman's importance in the development and establishment of functionalism in Mexico is described here not only as a social solution to urgent housing problems for the Mexican proletariat but as an ideologically constructed aesthetic and architectural solution by the Mexican cement industries. This chapter concludes by illustrating how O'Gorman's involvement with functionalism eventually led to his profound disillusionment with architecture and a turn toward realist painting as a direct way to incite class consciousness and revolutionary class struggle. Finally, in the last chapter I discuss the monumentalization of the Revolution as exemplified in the Monument to the Revolution by Carlos Obregón Santacilia and the Monument to Álvaro Obregón (1934-1935) by Enrique Aragón Echeagaray and Ignacio Asúnsolo. The development of architectural monuments is studied in relation to the political transformation of the Revolution in the process of its institutionalization. These shifts in meaning are reflected in the way that art was to work with the architecture. No longer part of the legacy of Vasconcelos to create a public and legible art whose social aim was to empower the masses, the new art and its architectural support were devoid of revolutionary potential and expressive of new forms of ambiguity. All in all, the present investigation is structured to begin cultivating an understanding of the unprecedented searches and challenges encountered in making architecture, space, and art in response to the Revolution and its multiple political and social aims. The formal and material outcomes are as varied as each individual's or group's perception of the Revolution as a catalyst of architectural and social change. Ultimately, the study offers a perspective through which to evaluate the role of the Mexican architectural avant-garde in the postrevolutionary cultural and political milieu and to explore the disruptive nature of its challenges and the utopian potential that they engendered.